Happy new year! January is upon us yet again, and with it - the inevitable promise to cook more, exercise more and eat more healthfully. We were home for vacation and I cooked every day. I splurged on some great cookbooks that I've used mainly as inspiration thus far (like this and this but can't wait to dive into in earnest. I'm re-committing to yoga - and trying to rope my husband in as well. I even managed to get our little one to family yoga which was terribly cute. I re-stocked the pantry with fresh spices plus specialty sauces and condiments lost in the hurricane power outage. I have some great Asian vinegars and dark soy to enjoy and some middle eastern spices like sumac that I've been wanting to play around with. I've been enjoying Tasting Table's Sous Chef series; a series of recipes by interesting chefs that are layered but not complicated to make. So far, a winning adobo that I will most certainly make again soon, and this tomato soup which was a little more involved than the typical but so bright and flavorful it's worth a bit of extra time. 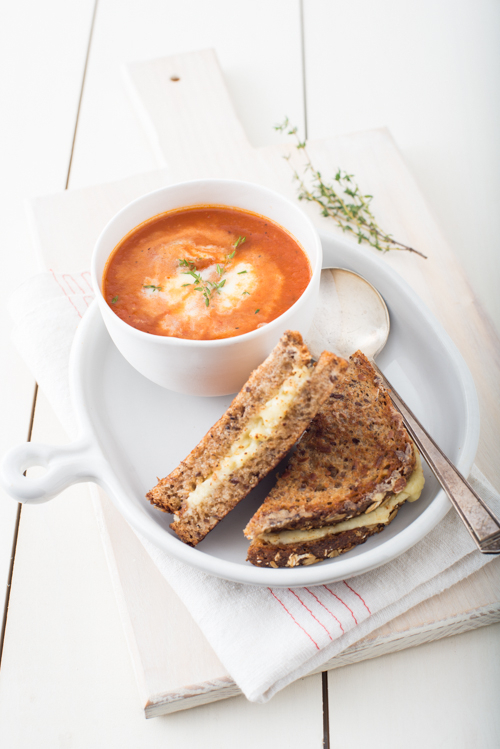 Tomato soup is so terrific on a chilly day - warming and also just seems like an instant boost of nutrients. Have a look at this recipe and see what you think. What are you inspired to do this year?